An ultrasonic pulse technique and infrared imaging system were applied to the reinforced concrete(referred as RC thereafter) slabs removed from an existing bridge in a replacing work to detect de- lamination. Moreover, non-destructive inspection (referred as NDI thereafter) methods were adapted to the slab in service to weigh the applicability. This study showed that pulse echo technique could make an accurate evaluation of the bond at the interface between the substrate and the overlay. Infrared imaging system suggested a possibility of the de-lamination detection. The problem of repair and strengthening of RC slabs has been called attention, particularly to the aging of highway bridges. In addition, the Japanese Government has deregulated the weight of heavy vehicle for making the cost of exports competitive. RC slabs on highway bridges must be repaired and strengthened at the same time. Japan Highway Public Corporation has strengthened concrete slabs for five years mainly on economically important routes, i.e. Tokyo-Nagoya Expressway and Nagoya-Kobe Expressway. Steel Fiber Reinforced Concrete (referred as SFRC) overlay has been introduced into the strengthening, and worked on the arterial expressway network. Scraping asphalt pavement off causes the prolongation of control period for a couple of days and the fatal decline of service level. Therefore, NDE in that no pavement removal is necessary has to be introduced from economical point of view. On the other hand, research and development on NDE of concrete structures have been rapidly advanced in these days. Dr. Sansalone et al. (4,5) presented papers on detecting of de-lamination of RC slab. Dr. Sansalone et al. had developed Impact Echo NDE system and had already tried to several actual structures. In fact, the low reproducibility of the impact and necessity of repeated tests remains a problem to be solved. Although pulse echo technique for the internal void has matured in laboratory, a few are reported in the application to in-service structures. The authors carried out the experiments of pulse echo and infrared imaging on slabs removed from an existing bridge that was repeatedly repaired and in- service slab. Detailed discussion is made on the applicability of each method to the RC slabs that were overlaid with SFRC. To investigate elastic wave propagation as well as waveform generator setting, gain control and the selection of suitable probe, two slab specimens cut out in a replacement work were prepared. The bridge had been strengthened by SFRC overlay. The specimens are 2m in width, 3m in length and 0.25m in depth. Fig. 1 shows the photos of the specimens that are referred as No.1 and No.2. Specimen No.1 consists of overlaid layer 80mm in thickness on substrate 160mm in thickness. For specimen No.2, the overlaid layer is partial and with 80mm in thickness. Thickness of pavement was adjusted to make surface of slab flat. SFRC overlay is usually worked all over the bridge slab. 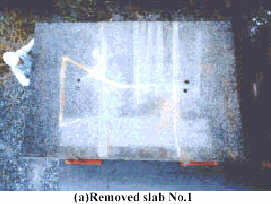 It is surmised that the slab was deceased and died at early age after repeat ed spot repair. Four test points denoted as point No.1 to 4 were marked on slab No.1 and five points denoted as point No.5 to 9 on slab No.2, respectively. Cylindrical sampling was done at all points at the end of NDE experiments to conduct verification.Table 1 and 2 represent visual inspection results from cutting off cylinder. 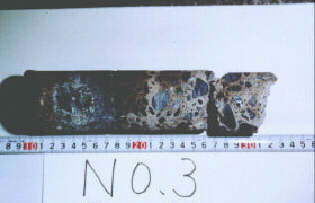 With regarding to specimen No.1, interfacial de-lamination between pavement and overlay was discovered only in point No.3 while for the specimen No.2 interfacial de- lamination was found in all the points. Moreover, de- lamination had occurred inside of the substrate under the point No.8 and 9 in specimen No.2. This shows that specimen No.2 was significantly deteriorated. Pulse echo experiments were carried out on all points. The heavily damped short pulse probes with nominal frequency of 500kHz were used. Pulse echo was performed by using double probe technique. The pulse signal with +150V voltage amplitude and 1ms in pulse duration is transmitted from waveform generator to one probe through amplifier. The device was set to obtain clear flaw echo. Fig.3 shows the recorded echoes at point No.1, 5 and 6, respectively. Arithmetical average of wave velocity of two specimens were 3380m/s and 3450m/s, respectively. The two probes were set closed to each other and contacted on asphalt pavement. Consequently, the three kinds of waves, compression wave, shear wave and Rayleigh wave, were clearly recorded in the echoes at the point No.1 and 5 where the pavement was relatively thick. If no interfacial de- lamination of overlay with pavement exists, it was reflected at concrete surface. Thereflected signal has the opposite phase with input one, because the acoustic impedance of concrete is grater than that of asphalt. In other words, interfacial echo has a negative electrical potential by piezoelectric effect. On the other hand, if any interfacial de-lamination exists, flaw echo that reflected at concrete surface has the same phase, because the acoustic impedance of air is less than asphalt. In other words, flaw echo becomes electrically plus dueto piezoelectric effect. The grass, which is the reflection and diffraction wave of aggregates, makes a noise at time 10ms at point No.1. Succeeding loud echo from the interface between the pavement and substrate appearsat around 50ms. The echo has negative electric potential and the interface is diagnosed as sound. It is consistent with the visual inspection of the cylinder. On the contrary, the echo at point No.5 has positive electric potential, being consistent with the visual inspection of the cylinder having a split at the interface. Moreover, the echo at point No.6 is slightly complicated since visual test revealedtwo de- laminations. The echo from the interface between the pavement and overlay is at around 20ms. Shortly afterward, electric potential ascends while descending at 45ms. Ascended amplitude is larger than the previous amplitude. This is the superposition of echo from the interface between overlay and substrate with the echo from the interface between pavement and overlay.The vibratory interaction ofthe pavement surface, PZT and damping block of probe makes echo dull. The observation and above-mentioned discussion demonstrate that when two interfacial de-laminations exist, the lower de-lamination should be inspected carefully and an only careful inspection makes detection of complex de- lamination possible. The applicability of NDE methods is evaluated by comparison of diagnosis results with those from visual inspections. The comparison results are tabulated in table 3 and table 4. In the table, "NA " expresses that diagnosis could not be carried out. In specimen No.1, all diagnoses are consistent with those of visual test. All de-laminations in depth from 25mm to 150mm were correctly diagnosed in specimen No.2 as well. The valid diagnoses for all interfaces are consistent with those of visual test. From the discussion above, the following conclusion can be obtained. The de- lamination from 25mm to 150mm in depth can be detected. All of materials radiate infrared rays. The radiation intensity depends on the temperature. In the case that body has an internal flaw, the more heat is supplied to it, the larger surface temperature gradient occurs. Infrared radiation intensity can be observed by infrared camera and surface temperature can be calculated by imaging system . Distortion and/or local singularity of the temperature map indicate the existence of internal flaw. 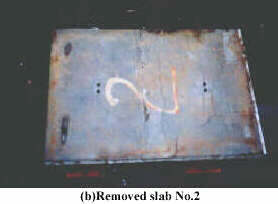 Surface temperature of removed slab was measured in the resolution of 0.1K. At a laboratory, the measurement was performed at 1-hour intervalsfrom 11am. Oct. 28 to 11am. Oct. 29, 1998. It was a fine weather and the range of atmospheric temperature was 15.8K. An example of surface temperature history is charted in Fig.4. The temperature rangeson the surfaceof removed specimen No.1 and No.2 are tabulated on Table 5 and 6, respectively. Point No.4 and 5 near the end of slab were omitted due to the influence of thermal boundary conditions. The temperature range of point No.3 where de- lamination was found was 1.0K higher than other points. The maximal temperature of the surface above internal flaw is larger than that w here no flaw exists. Therefore, the temperature range was higher than other points. In specimen No.2, no noticeable difference was found. This was considered as the effect of the complicated composition of slab section. Surface color of the specimen was slightly different each other, therefore, it was hard to compare simply the temperature of them. The evidence above indicates that de-lamination causes an increase in the maximal surface temperature. However,it was affected by the factors such asthe color of pavement, the composition of section and thermal boundary condition as well as meteorological condition. These factors should be taken into account for making an evaluation of de- lamination. The NDE mentioned and discussed in chapter 2 was tried on an in -service bridge and its applicability to existing bridge was considered. 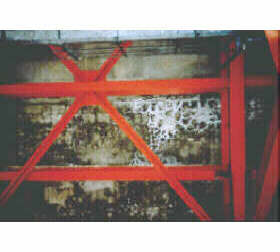 The slab of the bridge was composed of a pavement layer, overlaid SFRC and RC substrate. The thickness of each layer was 50mm, 60mm and 160mm, respectively. The NDE trial was carried out over 3 hours on central lane under traffic control. The adjacent lanes were in-service during the evaluation. The evaluation was limited in a region of 10m in length where map crack occurred underneath the slab. The pulse echo is diagramed in Fig.5. The velocity of the surface compression wave through the pavement was 3500m/s. Since the pulse echo method was applied to resonance probe, the reflection wave overlapped with Rayleigh wave because of the interaction between the probe and the pavement surface. 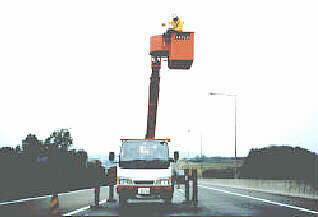 Although electric noise became loud when vehicle passed by on adjacent lanes, it never went beyond the accessible level. Fig.5 gives a sign of reflection waves from de - lamination at 30ms and 60 ms. These points can be estimated as the interface between pavement and SFRC, and SFRC and substrate by wave velocity and arrival time. Therefore, it is possible that interfacial de-lamination has occurred. The history of the vibration of PZT on surface is slightly obscure because the reflection wave arrived before damping down of impulsive vibration, however, the selection of suitable probe and electric setting will clearly distinguish the reflection wave s.
The measurement of surface temperature was performed three times from 1pm. to 3pm. Nov. 26, 1998 and in an area of 2m in length and 2.5m in width. It had a cloudy weather and climate temperature at 1pm. was 288.5K. The range of surface temperature in 3 hours is charted in Fig.6. At a distance of 0.75m from the center of the lane, high temperature ranges were easily found. These lines were the trace where tires of vehicles had rolled just before measurement. 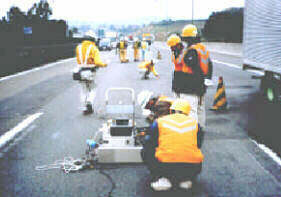 A suitable setting of pulse echo can clearly detect the de -lamination of SFRC overlaid slab designed according to specification for highway bridges. NDE with Infrared imaging system is influenced by pavement color and dust on surface in regarding with slab in-service slabs, although the temperature of slab in good weather condition can be detected easily. The Japanese Society for Nondestructive Inspection, "NDI methodology for concrete structure, " Yokendo Ltd., 1994 (in Japanese). The Study Committee on Nondestructive Testing Method for Concrete, "Special Report of Research on Nondestructive Testing Method for Concrete Structure, " the Japan Concrete Institute, 1992 (in Japanese). Kanno, T., Iizuka, Y. and Horie, H., "Current Status of Nondestructive Testing in Road Bridges, " Journal of the Japanese Society for Nondestructive Inspection, the Japanese Society for Nondestructive Inspection, Vol.45, No.7, 1996, pp.493-496 (in Japanese). Sansalone, M. and Carino, N.J., "Detecting De-laminations in Reinforced Concrete Slabs with and without Asphalt Concrete Overlays Using the Impact-Echo Method, " Material Journal of the American Concrete Institute, the American Concrete Institute, Mar./A pril, 1989, pp.175-184. Sansalone, M.J. and Streett, W.B., "Impact-Echo Nondestructive Evaluation of Concrete and Masonry, " Bullbrier, 1997, pp.29-46 and 159-166. Graff, K.F., "Wave Motion in Elastic Solids, " Dover, 1991, pp.311-391. Yoshiara, T., et al., "Nondestructive Evaluation by Ultrasonic for Concrete Material, " Proceedings of the Fall Conference, the Japanese Society for Nondestructive Inspection, 1996, pp.297-300 (in Japanese).